November 04, 2016, 11:03 a.m. Being cool is one of those intangible concepts – it&apos;s hard to explain how to be it, but you know it when you see it. Britain certainly has a decent claim to being a cool country – our music and other cultural success is renowned the world over, even giving rise to the phrase "Cool Britannia" during the 1990s. But just how cool are the people of Britain? New YouGov research can now reveal that the cool population of Britain numbers around 31%, whilst more than half of people (56%) say they are not cool. It would appear that escaping the stifling social hierarchies of school allows people’s coolness to flourish. Just 22% of people believe themselves to have been cool at school, compared to 68% who don’t think they were – this represents a 10.5 point swing towards being cool from the time people went to school and the present day. Coolness – at least, the self-perceived kind – doesn’t seem to go away. About two thirds of people who say they were cool at school say they are still cool now. Of those 3% of Brits who say they were very cool in school, a full 41% still assign themselves the Fonz-like status of being very cool now. On the flip side, about a quarter of people graduate to coolness upon leaving school, with 23% of those who don’t think they were cool in school believing themselves to be now. For the very least cool at school, this drops to 14% of (of whom just 1% have climbed the full scale and made it to very cool). Perhaps unsurprisingly, the older people get the less likely they are to consider themselves to be cool. Whilst 42% of people aged 18-29 say that they are cool, this drops to around a quarter of those aged 45 or older. Gender also plays a role in coolness – but only up to a certain point. Differences between the genders basically disappear once people reach their thirties. For those aged 18-29 though, women are particularly likely to say they think they are not cool compared to men – almost half of women, compared to just a third of men. Northerners think they are the coolest Brits, with just over a third (35%) describing themselves as either very or quite cool. Southerners, on the other hand, are the least cool, with just 28% saying they were cool. Asking people who they think coolest person in fiction reveals James Bond to be the public favourite by far. With the support of 21% of people who gave an answer, Bond towers over his nearest competitors – all of whom happen to be superheroes (Superman 7%, Batman 6% and Iron Man 5%). In terms of real-life people, outgoing US president Barack Obama tops the list, with 9% of people who gave an answering picking him. David Beckham is seen as the second coolest person, with 7% of people naming him. One of the most noticeable things about the list of cool characters and figures that people chose was the dominance of men. For fictional characters, 89% of the cool figures people suggested were men, compared to just 11% women. For real world people the figures weren&apos;t much better – 78% men and 22% women. The coolest female fictional character was Lisbeth Salander – of Girl with the Dragon Tattoo fame – with just of the vote 1%. 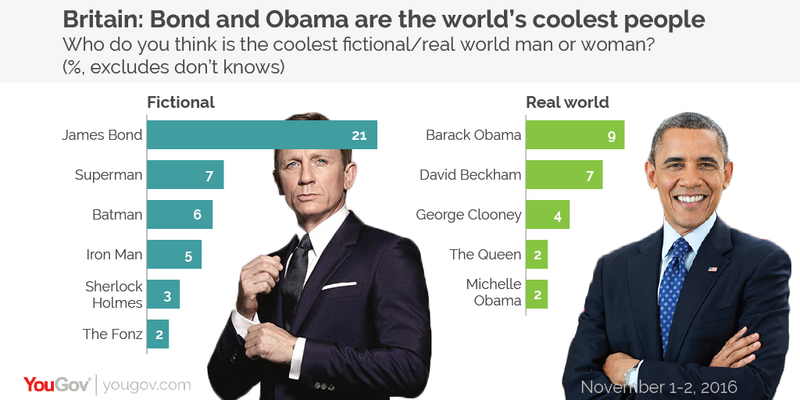 In the real world, first lady Michelle Obama was seen as the coolest female figure with 2%, tied with The Queen.